We just enjoyed the first Sunday home since mid-August. It's been good to catch up on mail and rest and other home responsibilities. I just finished writing a few pastors that we've visited recently, expressing our gratitude for making deputation such a pleasant experience for us. We were so grateful for good meetings over the last few weeks. First, we met with Lighthouse Baptist Church in Eagle Mountain, UT. I enjoyed reconnecting with Matt Ortega and meeting his family for the first time. He shared with me some of the challenges of ministry in a primarily Mormon context. At the end of a long conversation on the point, he reminded me that, while detailed critique of Mormonism has its place, the gospel is what the people of Utah need, just like the people of Kenya, and anywhere else. He encouraged me to take a visit to the LDS headquarters in Salt Lake City, and I took him up on it. I'm glad I did, what an enlightening experience! 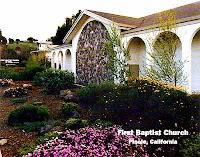 Next, we were back in California for a meeting with First Baptist Church in Pinole. I was excited to have an opportunity to teach the adult Sunday school in addition to the regular preaching time in the evening. They were very attentive and asked some excellent questions about the lesson. (The lesson was on mining truths from narratives, using 1 Sam 15 as a test case.) I am eager to have this kind of opportunity every week when we reach our destination! I should be posting an Autumn newsletter soon, so watch this space! (1) Safety as we travel again to California and then to Colorado in the coming weeks. (2) Autumn is typically a time for allergies for us, and flu season is supposed to be especially bad. Please pray for our health. (3) Pray for God's timing and provision for getting to Kenya. It's been too long since my last update. We had two rescheduled meetings at the beginning of August, so I didn't have much news to share at that end of the month. Then with back-to-back meetings and lots of travel, I haven't made time to sit and update things. 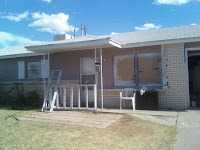 The beginning of August was spent in El Paso, TX, helping a couple of regular financial supporters (who also happen to be responsible for my genetic fabric) with a big painting project. They enjoyed the company of their grandchildren, Josiah and Jonas. I enjoyed another manual labor project that will help fill up what is lacking in my mostly theoretical missionary education. A rescheduled meeting allowed us to spend more time on the project than we had planned. That turned out for the best because equipment issues made the painting project take longer than anticipated. We were able to catch two meetings before the end of the month. The first meeting was at Seacoast Church, Redondo Beach, CA. The pastor there worked at my church in El Paso when I was young. It was at his house, during a summer backyard Bible study, that I was converted. It was neat to share some old fond memories with them and to get to know this congregation of believers. Pastor Huddleston was in the middle of a series on the glory of heaven. A quote he brought from Puritan pastor John Owen stuck with me. He didn't give the specific reference for Owen in the sermon, but I think this is where the quote came from with some of its context: "We know that they who like not grace here, neither do nor can like that which is glory hereafter. No man who is not acquainted experimentally, in some measure, with the life, power, and evidence of faith here, hath any other heaven in his aim but what is erected in his own imagination" ("Of Spiritual Mindedness," The Works of John Owen, vol. 7, p. 338). The next week, we were in Tucson, AZ, at Continental Baptist Church. Pastor Mike Gradwell welcomed us into his home. That Sunday morning, he challenged his church to be wary of the hour and power of temptation from the story of Joseph in Genesis 39. We appreciated the reminder, especially as Pastor Gradwell brought it back in the end to our need for grace in Christ to resist temptation. While we stayed with the Gradwells, Josiah enjoyed a fun time with their four delightfully active young boys. Needless to say he was sorry to leave as soon as we did. After a day or two back in Albuquerque, we attended our first missions conference of the year. In Sonora, CA, we were challenged by one missionary who is working in North Africa and another who represents a mission board with missionaries around the world. The missions conference, though it was short, did afford us some extra time to get to know some of the people of Grace Baptist, and we were grateful for the opportunity. This week we're in American Fork, Utah, presenting to a church planted by one of my friends from Hebrew class in seminary. We're looking forward to touching base again with friends and getting to know this church. Next week takes us to Pinole, CA, and then we'll have some back time in Albuquerque. We praise the Lord for (1) an emerging, workable rhythm in travel with the kids, (2) health and safety on the roads, (3) several good meetings and good hope for future partners, and (4) the generosity and hospitality of God's people in the churches we have visited recently. Pray with us for (1) wisdom in parenting, (2) continued health and safety, (3) more churches to partner with us, and (4) mutual encouragement of faith in our meetings and conferences.